In Luke’s Gospel Jesus sends seventy-two out in pairs to do the work of His mission. Jesus sent these lay ministers out with His authority, with a mission to care for His people, especially the sick. Nothing has changed since that time. Jesus is still very much with us, and seeks to send us out with a commission to spread His love to those who need it. 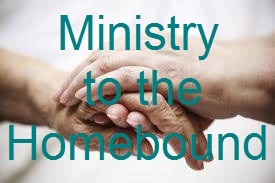 Ministry to the sick and homebound is a unique, intimate and beautiful one. Sr. Evelyn Ronan will join us for a spiritual journey through this ministry, followed by an informal discussion over breakfast. If you feel called to visitation of the sick and homebound please join us for an enriching morning. This entry was posted in Adult Faith Formation, Lent, SJSP Collaborative, SJSP Collaborative Programs and Events. Bookmark the permalink.